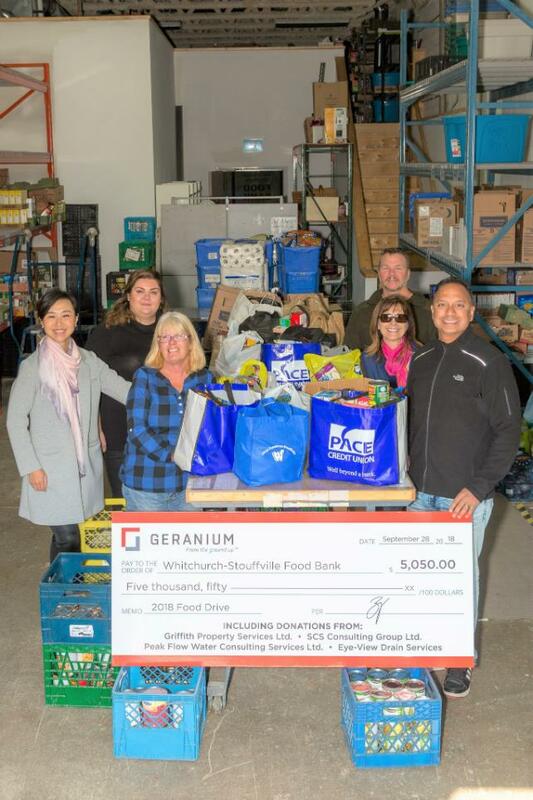 The donation includes donations from Geranium, PACE, and SCS Consulting Group Ltd., Griffith Property Services Ltd., Peak Flow Water Consulting Services Ltd., and Eye-View Drain Services. Geranium’s involvement in the community began a decade ago with the award-winning, master-planned community, The Neighbourhoods of Cardinal Point. The community spans 100 acres north of Main St., from Hwy 48 to Ninth Line. The community features a variety of housing types from detached homes to stacked townhomes and condo suites. The mix of housing types allows for a diverse array of residents to form a vibrant community. 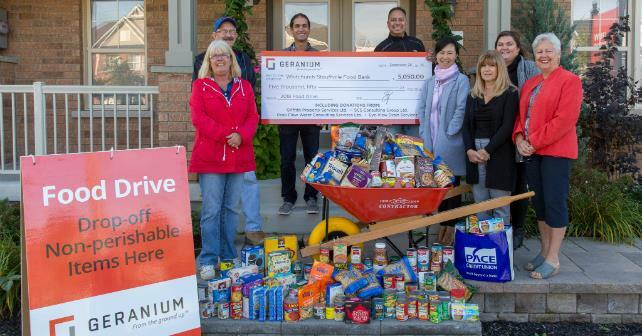 Throughout September, Geranium also reached out to residents of The Neighbourhoods of Cardinal Point to collect non-perishable food items, which will be distributed in time for Thanksgiving this weekend. The $5,050 will go towards fresh food like meat, fruit, veggies, bread, and dairy. “Giving back to communities in which we build is very important to us and remains one of our core principals,” says Boaz Feiner, President of Geranium. In 2016, Geranium was a supporting sponsor of the Main St. Habitat for Humanity project, which built a home for a working, low-income family in Whitchurch-Stouffville. Geranium has a number of communities in the works, including Allegro in Aurora, Friday Harbour in Innisfil, PACE on Main Condos in Stouffville, Edgewood in Pickering, and move-in opportunities in The Neighbourhoods of Cardinal Point! They also have new communities coming soon in Pickering, Port Perry, and Midhurst.